Thor was the god of thunder and of the sky in Norse* and early Germanic mythology. Though Odin* held a higher rank, Thor seems to have been the best loved and most worshiped of the Norse deities. He belonged to the common people, while Odin appealed to the learned and noble classes. 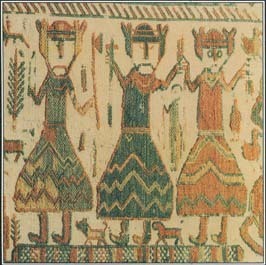 A patron of farmers, Thor was associated with weather and crops. Although he could be fearsome, many myths portray him in a comic and affectionate way. Origins and Qualities. Thor appears throughout Norse mythology as a huge, strongly built, red-bearded fellow with a huge appetite. He grew out of Donar or Thunor, an ancient god of sky and thunder. Some myths say that Thor was the son of Odin and Fjorgyn, the earth goddess. His wife was the beautiful goddess Sif, who seldom appears in myths and remains a somewhat mysterious figure. Generally good-natured, Thor had a hot temper, and his anger was dreadful to behold. He was a fierce enemy of the frost giants, the foes of the Norse gods. When people heard thunder and saw lightning in the sky, they knew that Thor was fighting these evil giants. The thunder god's chief weapon was his mighty hammer Mjollnir, or Crusher, which the dwarfs had forged for him. When he threw Mjollnir, it returned magically to his hand like a boomerang. Among Mjollnir's other powers was the gift of restoring life to the dead. The connection of Thor's hammer with life and fertility gave rise to the old Norse customs of placing a hammer in a bride's lap at her wedding and of raising it over a newborn child. Thor's treasures also included a magical belt that doubled his strength whenever he wore it and a pair of goats, Tanngniost and Tanngrisni (both "Toothgnashers"), that pulled his chariot across the sky. Whenever he was overcome with hunger, Thor would devour his goats, only to return them to life with Mjollnir. Thor, the Norse god of thunder and the sky, appears in the center of this tapestry holding his mighty hammer. Myths About Thor. According to one well-known myth about Thor, Thrym, king of the giants, came into possession of Mjollnir and declared that he would give it back to Thor only if the beautiful goddess Freyja agreed to marry him. She angrily refused, and the trickster god Loki came up with a clever plan to recover Mjollnir. Using women's clothing and a bridal veil to disguise Thor as Freyja, Loki escorted "Freyja" to Jotunheim, the home of the giants. Thrym greeted his bride, though he was surprised at her appetite at the wedding feast. "Freyja" consumed an entire ox, three barrels of wine, and much more. Loki explained that she had been unable to eat for a week because of her excitement at marrying Thrym. The giant accepted this explanation, and the wedding proceeded. When the time came for a hammer to be placed in the bride's lap according to custom, Thor grabbed Mjollnir and threw off his disguise. Then he used the hammer to smash the giants and their hall. During another visit to Jotunheim, Thor and Loki met Skrymir, an especially large giant. He was so big that when they wandered into one of his gloves, they thought they were in a mansion and slept in one of the fingers. In the morning they found Skrymir sleeping, and Thor tried to crush the giant's head with Mjollnir. Skrymir simply brushed away the blow as though it were no more than a falling leaf. The gods traveled on to Utgard, a city of giants, where the giants challenged Thor to drain their drinking cup and lift their cat from the floor. He could not do either—the cup was connected to the sea, and the cat was really Jormungand, the serpent that encircles the world. Although Thor failed the tests, he came close to draining the ocean and removing the world serpent. Several early Norse sources recount the myth of Thor's encounter with the giant Hymir. Thor disguised himself as a young man and went fishing with Hymir, first killing the giant's largest ox to use for bait. Thor then rowed their boat far out of sight of land and cast his hook. Something bit at the ox, and Thor drew up his line to discover that he had hooked Jormungand, the giant serpent. Placing his feet on the ocean floor, Thor pulled and pulled on the line, while the serpent spit out poison. Just as Thor was about to strike Jormungand with his hammer, Hymir cut the line and the serpent sank back down to the depths. Many myths say, however, that Thor and Jormungand remained bitter enemies, fated to fight again on the day called Ragnarok, the end of the world, when they will kill one another. See also Loki ; Norse Mythology ; Odin . Awsome!so awsome! thegiant serpent sounds cool. thor will be a great movie! i look forward to seeing it. What does Thor fight for? Like, what is his mission? Like, Spider-Man fight s to protect the innocent from harm, but what does Thor fight for?